Introducing the impeccable Ceilidh (pronounced Kay-lee), a Ta Shing Panda 40’, designed by Robert Perry. Ta Shing Panda’s are designed to go anywhere in the world in comfort and are arguably the best quality and designed sailboat to come out of Taiwan. A Doctor had Ceilidh commissioned in 1982 and then shipped directly to Maine where she has spent the majority of her life. The second owner, a retired MIT Engineer, kept Ceilidh looking her best and explored Maine on her for 18 years until he was too old to pull the lines anymore. 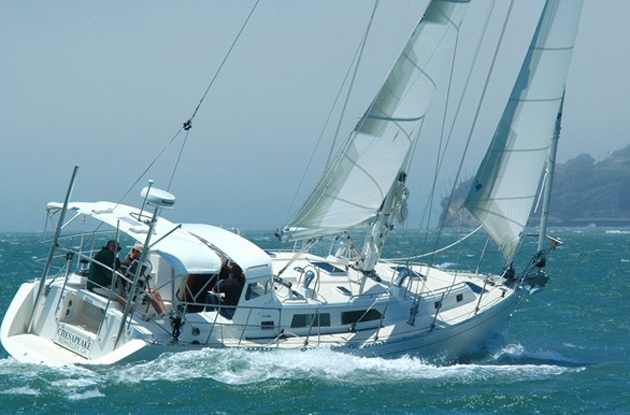 The current owners have continued the legacy of pristine maintenance of the boat and have put numerous hours into Ceilidh to ensure her bright future afloat. Every project onboard has been done to the finest degree of effort possible, with a surgeon’s touch, precision and preservation. That’s because the current owner is a surgeon; he and his wife love the boat dearly and their affection shows in every aspect and inch of the vessel. Ceilidh was re-powered in 2003 with a Yanmar 4JH3 56hp engine and the aluminum fuel tanks were new in 2015. The Selden mast and boom as well as the standing rigging were new in 2009. 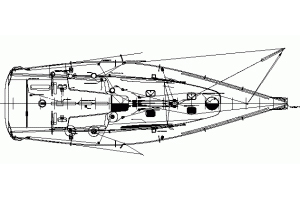 For Depth, Wind Direction and Speed the Raymarine ST60+ is located at the helm station as well as a Furuno 1723 NavNet Radar and a Garmin 2006C Chart Plotter. There is one ICOM VHF at the helm and one at the Navigation Table down below, and a Ritchie compass on the binnacle above the helm. She has 3 – 8D AGM House Batteries and 1 – Group 31 AGM Starter Battery charged by the Yanmar and a Xantrex Prosine Sine Wave Inverter and Battery Charger when ashore. She has a Simpson Lawrence Horizon 600GD 12VDC electric windlass to haul the 45lb CQR with 250’ 3/8” chain up and a Danforth and Fisherman onboard as well. 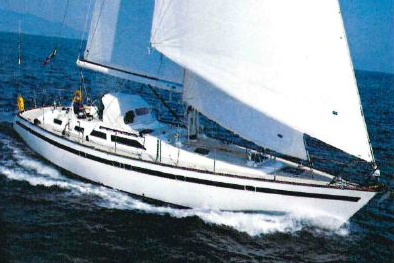 Her main, staysail and jib are all on Furler’s to make sailing a breeze and sail handling easy from the cockpit. Down below in the galley she’s equipped with a 3-burner propane gimballing stove and oven, an Adler Barbour Cold Machine in the ice box and there is pressure hot water at the stainless steel sink as well as in the head for the shower and sink. Also, in the head is a Wilcox Crittenden Imperial toilet. To keep warm in the salon there is a Buddy cast iron stove that can be used with wood or charcoal briquettes. The salon has a U-shaped settee to starboard and a long settee to port. The U-shaped settee drops to a double berth. The cabin forward has a large v-berth and can be closed off from the rest of the boat for privacy. There is excellent storage throughout the boat. The Navigation Table is aft of the starboard settee and is a nice space to roll out charts or study cruising guides with good access the the electrical panels and battery switches. The aft cabin is well laid out with storage forward and a large quarterberth. This cabin can also be closed off from the rest of the boat for privacy. 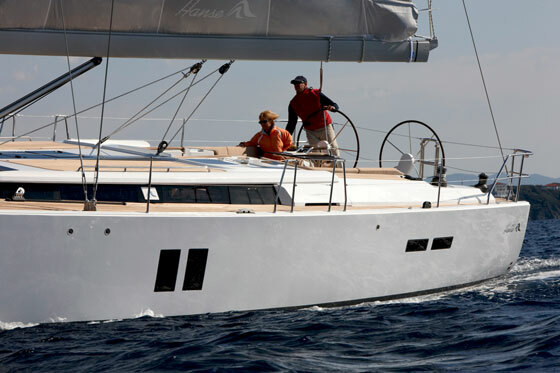 Ceilidh can sleep 7 comfortably between the forward cabin, salon and aft cabin. She’s incredibly roomy below with great hand holds throughout the boat. Her cabin height is 6’6” and the berth’s are all long and wide. Ceilidh can take you where you want to go in absolute class and comfort. 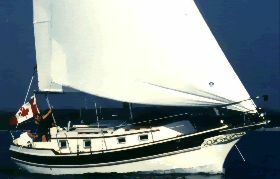 Come visit Ceilidh in her current slip in Port Townsend to experience her quality and beauty in person. 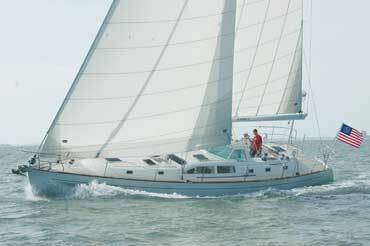 Ceilidh has been immaculately maintained, is turn-key and is ready to voyage with her next owner(s)! This is a great opportunity to own one of Robert Perry’s most popular designs; the Ta Shing Panda 40. Showings available immediately by appointment only, thank you.